This region offers numerous walking opportunities with spectacular views in and around the 45,707-hectare Pyrenees National Park. 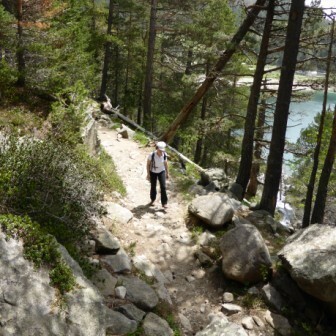 There are beautiful mountain and woodland walks, which range from a quiet stroll around the lake at Payolle, to a serious trek around Chiroulet with 1000m of vertical ascent. Guides for local walks in each valley can also be arranged through the local tourist information and maps are available from shops in Bagneres-de-Bigorre. You can also enquire at any of the Valleys tourist information offices for more local advice on routes. The Pyrenees are a range of mountains in southwest Europe that form a natural border between France and Spain. They separate the Iberian Peninsula from France, and extend for about 430km (267 mi) from the Bay of Biscay on the Atlantic Ocean to Cap de Creus on the Mediterranean Sea. For the most part the main crest forms the Franco-Spanish frontier, with the principality of Andorra sandwiched between them. The principal exception to this rule is formed by the Val d'Aran, which belongs to Spain but lies on the north face of the range. 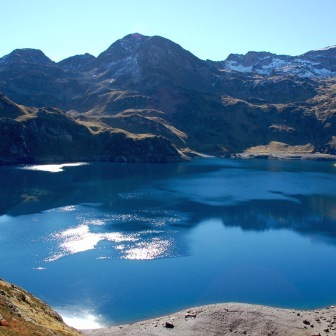 The Pyrenees are older than the Alps: their sediments were first deposited in coastal basins during the Paleozoic and Mesozoic eras - between 250 million and 65 million years ago. In the Lower Cretaceous period, the Gulf of Gascony (Bay of Biscay ) fanned out, pushing Spain against France and putting large layers of sediment in a vice grip. The intense pressure and uplifting of the Earth's crust first affected the eastern part and stretched progressively to the entire chain, culminating in the Eocene epoch. - the frequency with which the upper end of a valley assumes the form of a semicircle of precipitous cliffs, locally called a cirque. The highest waterfall is that of Gavarnie (462 m / 1,515 ft), at the head of the Gave de Pau; the Cirque de Gavarnie, in the same valley, is perhaps the most famous example of the cirque formation. Low passes are lacking; between the two end of the range, where the principal roads and the railways run between France and Spain, there are only the Col de la Perche and the Col de Somport or Port de Canfranc, on the old Roman road from Saragossa to Oloron-Sainte-Marie.